A simple, easy way to capture and dispose of mice or insect pests. 4-pack of Glue Cards is coated with a powerful adhesive covered with special release paper. Unique glue specially formulated with tenacious gripping power, holds pests in place to ensure capture. Non-toxic and pesticide free. Can also be used for cockroaches, scorpions, spiders or other insect pests. 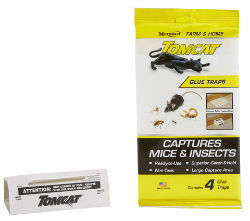 Simply place the glue cards along walls or areas where mice & insects travel - use flat for full surface area or fold up into a tunnel as a covered trap. Glue Traps are 7.75 Long x 5.25” Wide.